Edmund is the Principal of the Patrick Foundation, an independent researcher with a background in business and land management. He qualified as a Chartered Land Agent and as an Associate of the Royal Institute of Chartered Surveyors (ARICS) at the Royal Agricultural College Cirencester and Wye College, London University. He founded British Wildlife Management in 1995 to lobby Parliament and other organizations for best practice in countryside and wildlife management. His Golden Age Project inspired by the work of Christian and Barbara Joy O'Brien promotes the recovery of past knowledge in order to resolve many of today's problems. He believes that re-establishing high standards of training and knowledge for all important roles, forms a priority in establishing good government and successful social organization and cohesion. 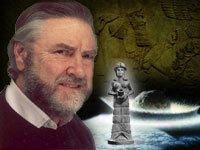 For the first hour of this program, Edmund discusses researcher Christian O'Brien and the Anu-Nagi (Annunaki). He also talks about global catastrophe, the restart of civilization, genetic interference, origins of agriculture, the Sumerian connection and Kharsag (The Garden of Eden). We move on to discuss the events that took place after the global catastrophe, sometime between 12 000 and 9 000 BC. Who were the Annunaki (or the Anu-Nagi)? We discuss their knowledge, language, their science, law, genetics and their efforts to survive. For our members, we continue our interesting conversation with Edmund and talk about the origins of farming and the evidence for genetic manipulation of seeds and domesticated animals. We discuss the origins of wheat & corn. Later, we talk about law and order and the reason for structure in the rebuilding of civilization. We also talk more about cyclical catastrophe and if there is any evidence about this. Could we be facing another global catastrophe? The Nephilim, Watchers, Giants, Grigori, Sons of God - Angels or Demons?